On the moon-like surface of the muddy crust that now covers a dozen Indonesian villages, any sign of life is welcome. "Right over there you can see some algae," says an excited Soffian Hadi, deputy head of operations for BPLS, the agency that monitors a still-seething volcanic crater. "When the eruptions stop so will the subsidence but we don't know when that will be for sure." The good news, if you can call it that, is that the amount of mud spewing from the earth has dropped significantly, from 180,000 cubic meters per day at its peak in 2006 to around 10,000 cubic meters per day now. The number of "bubblers," or gas vents, has dropped from 243 to 17, though residents still complain of polluted water and stinky air. The bad news is that five years after the eruption, scientists still aren't quite sure when the mud will stop. The general consensus is the muck will flow for decades, not centuries. Beyond that, not much is known. "It's impossible to predict when you don't know what you're dealing with," says Mark Tingay, a lecturer in drilling engineering at that the University of Adelaide. "We don't know a lot about what's going on underground." On the ground in East Java, the local government is planning a 3D mapping project designed to help scientists visualize what's happening below the mud. The government-appointed monitoring agency, BPLS, has been handling the clean-up process by draining the mud into the Porong River, which has mainly been used as a flood canal since the Dutch diverted it hundreds of years ago to protect the nearby city of Surabaya. 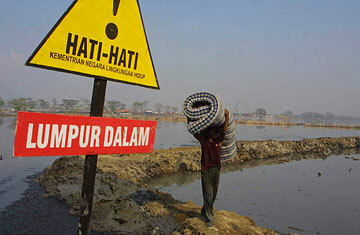 Lapindo Brantas, the Indonesian firm that was drilling in the area ahead of the eruption (but was cleared by the Supreme Court of any culpability for the disaster) reports it has spent $600 million relocating families, though displaced villagers say they have yet to receive another $100 million owed to them in the agreement. The central government has also spent $125 million and allocated another $130 million to be disbursed this year. Recovery is complicated by the fact that the situation in East Java has not elicited the outpouring of international support that follows disasters. No lives were lost and in all likelihood, there won't be any television-friendly shots of villagers re-building their homes amid freshly-cleared rubble. The nearly 2000 acres of land is all but abandoned save for scientists examining the squishy earth. "It's important now to focus less on the past and to figure out what to do in the future," says Jeffrey Richards, executive director of the Humanitus Sidoarjo Fund, which recently released a 160-page social impact report on the mud volcano. With so much seismic activity shaking the country every year, that future may well include another eruption. Indonesia is home to 76 active volcanoes and East Java is home to four mud volcanoes, many of which are situated in densely populated areas. Soffian Hadi, of BPLS, the monitoring agency, say the organization would share whatever information they glean about the volcano with the public. "Hundreds of thousands of people will be affected over the next few years," he says. "It could happen again so we need to prepare people."